Yellow-bellied sapsucker holes are in lines. Attacks a wide range of fruit and ornamental trees. The Yellow bellied Sapsucker is a woodpecker, a type of bird, its damage is sometimes confused with borers or canker diseases. 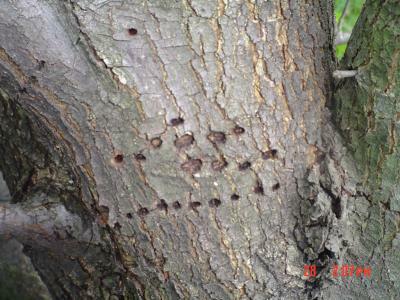 The sapsucker makes feeding holes in line patterns (one or more lines of holes, several holes to many holes per line, lines may be across or up and down or on an angle). The holes are made on the trunk between the branch whorls and not at the whorls or where branches attach. The location separates the bird from Zimmerman pine moth and the holes separates it from canker diseases. Pitch often accumulates over these holes after the bird leaves. The bird is protected by state, federal, and international laws. The bird migrates from over wintering areas in the Gulf states and Mexico to nesting sites in far northern states and Canada in the spring and returns south in the fall. Individual birds tend to stay in an area no more than 48hours in Illinois. However the entire migration may last six to eight weeks depending on weather. These birds are typically in Illinois in early spring and late fall. In areas of the south where this woodpecker overwinters and in the north where it nests, birds will feed on individual trees repeatedly, sometimes killing them. Place an inflated snake or solid (for example, wood) owl near the affected area in the tree during migration. This can help reduce additional damage. Trunks and branches can also be covered with tree wrap to reduce damage, but it must be removed by late spring and not replaced until after summer.